Generate Objective-C source code to and from JSON. Is there a better alternative to JSON Class Generator? Is JSON Class Generator really the best app in Developer Tools category? Will JSON Class Generator work good on macOS 10.13.4? 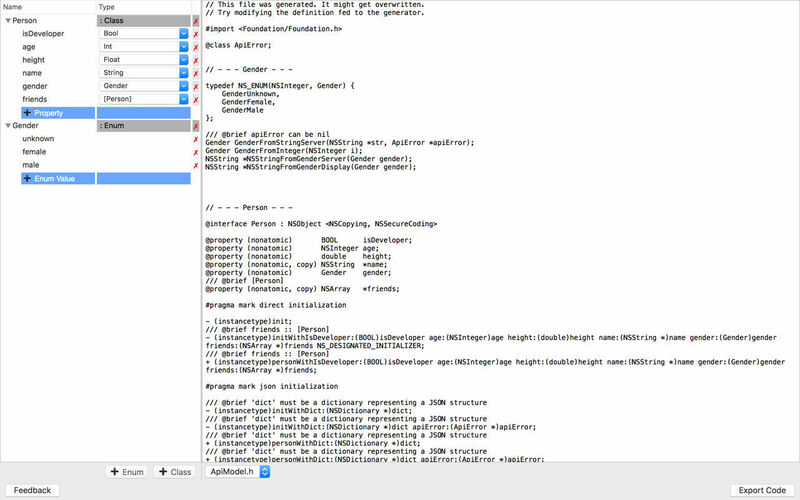 JSON Class Generator generates Objective-C source code from the classes and enums that you define in the editor. The source code has methods for converting/parsing to/from JSON. Quality - The generated code is type safe, yet fast (no use of introspection). It makes your client robust against all kinds of invalid structured responses from backends by always returning structurally sound data - providing fallback values, if necessary. JSON Class Generator needs a rating. Be the first to rate this app and get the discussion started! Proven - The tool has accelerated the development of commercial iOS and Mac applications since late 2014 including one of Europe's fastest growing internet ventures. It has been continuously tested and improved after encountering weird circumstances in practice. A few million network requests later, you can now reap the rewards and buy a rock solid solution that will ease your life, when it comes to dealing with JSON in your application. Easy - Editing the models in the UI is a cinch compared to using one of the many libraries for mapping JSON to Objects. You don't have to write any code yourself anymore. Make the Decision - Free yourself from writing glue code. Describing an API is always easier than implementing one, especially if you later want to do modifications. Be the architect! Trial Version - The trial version does work for a limited time, before requiring activation. It does not come with any other limitations. You can of course keep the code, that you have generated during the trial period. There is also a tutorial and a sample project on our website.